I am not a patient baker. My desserts tend to be “rustic” which, in my case, is a polite way of saying messy and imprecise. Fortunately for me there is a place in the dessert world for my rustic desserts. I call it my sweet spot (pun intended) which includes crisps, crumbles, cobblers, galettes, and crostatas. These desserts show off the season’s best fruit, in the company of some sort of pastry dough or streusel and are assembled in a delightfully unfussy way. 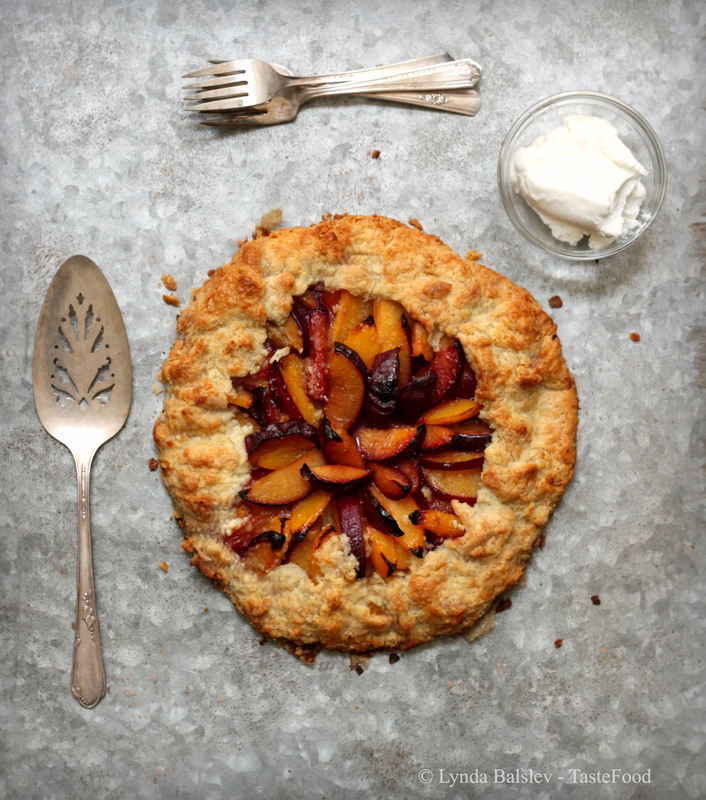 This Cranberry Pear Galette is a perfect example – it’s a free-form tart, which is also known as a crostata. Unlike a traditional tart or pie, a baking dish is not required. The spiced fruit filling is simply mounded into the center of the pastry dough, then the pastry edges are gathered and folded around the filling leaving the top exposed. The result is a golden free-form crust cocooning a bubbling center of oozing fresh fruit. Now, that’s my kind of dessert. Try this one on for your Thanksgiving holiday. 1. Make the pastry dough: Place the flour, sugar, and salt in the bowl of a food processor and pulse once or twice to blend. Add the butter and pulse until the mixture resembles coarse meal and the butter is pea-sized. Add the water and pulse until the dough just comes together. Transfer the dough to a work surface and flatten into a disk. Wrap in plastic and refrigerate for at least 1 hour before rolling out. 2. Roll out the dough on a piece of parchment paper into a circle approximately 12-inches in diameter. (It does not have to be perfect!) Slide the dough onto a baking sheet and refrigerate while you prepare the filling. 3. Preheat the oven to 400°F. Combine the pears, cranberries, 1/4 cup sugar, 2 tablespoons almond meal, the lemon juice, orange zest, cardamom, and cinnamon in a bowl. Stir to combine. 4. Remove the dough from the refrigerator. Sprinkle 1 tablespoon almond flour over dough, leaving a 2-inch border. Mound the fruit over the almond flour. Fold the borders up and around the fruit. Lightly brush the dough with the egg and sprinkle the galette with the 1 tablespoon sugar. 5. Transfer the galette to the oven and bake until the crust is golden and the fruit is tender and bubbling, 35 to 40 minutes. Serve warm or at room temperature with whipped cream or vanilla a ice cream. 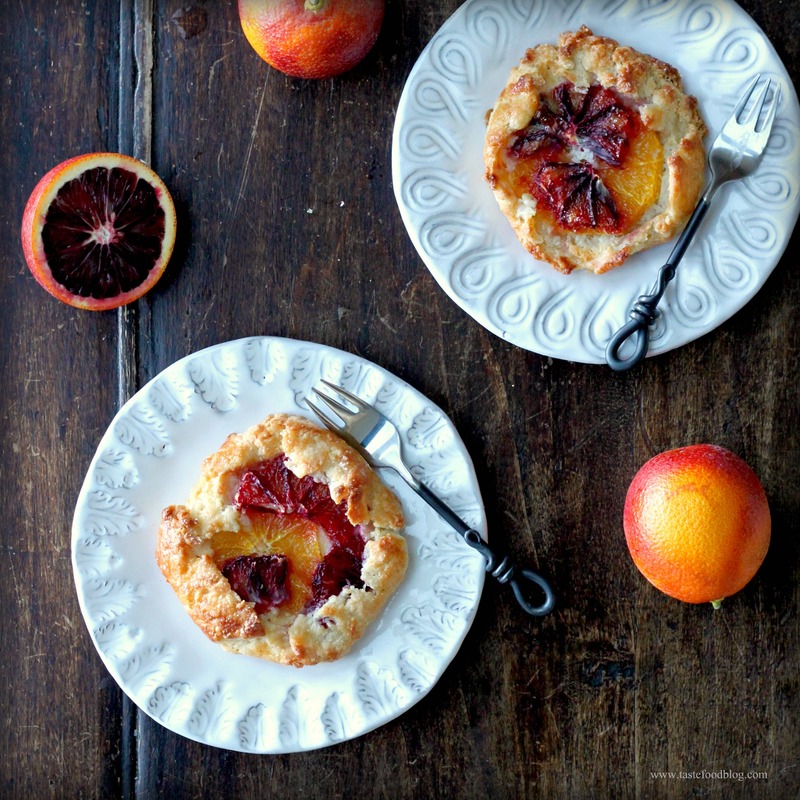 When life hands you plums…make a galette – or a crostata, depending on which side of the alps you sit. 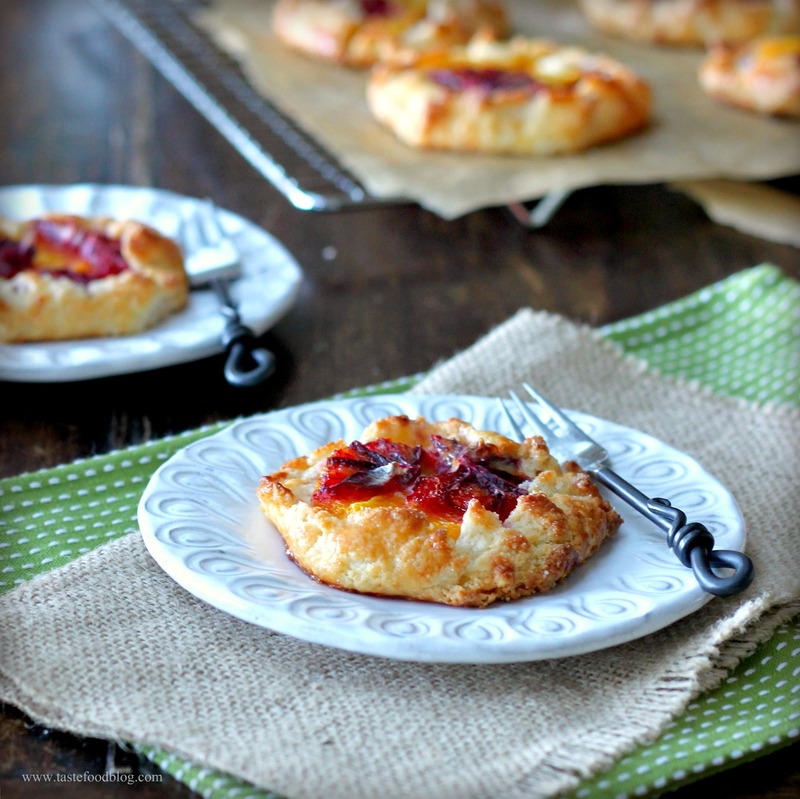 These free form tarts are refreshingly rustic. Their simple duty is to showcase seasonal fruit with little to-do. Big on flavor, short on fuss, with lots of crumbs welcome. My kind of dessert. Place the flour, sugar and salt in the bowl of a food processor. Pulse to blend. Add half of the butter and process until the dough resembles coarse meal. Add the remaining butter and pulse until the pieces are pea-sized. Transfer to a bowl. Sprinkle in the water while stirring and fluffing with a fork. Stir and toss until the dough comes together. Gather the dough into a ball and flatten into a disk. Wrap with plastic and refrigerate for 1 hour (or up to 24 hours). Preheat the oven to 375°F. Whisk the almond meal, 1 tablespoon sugar and the cinnamon in a small bowl. Roll out the dough into a 14-inch round. Spread the almond meal over the dough, leaving a 2-inch border. 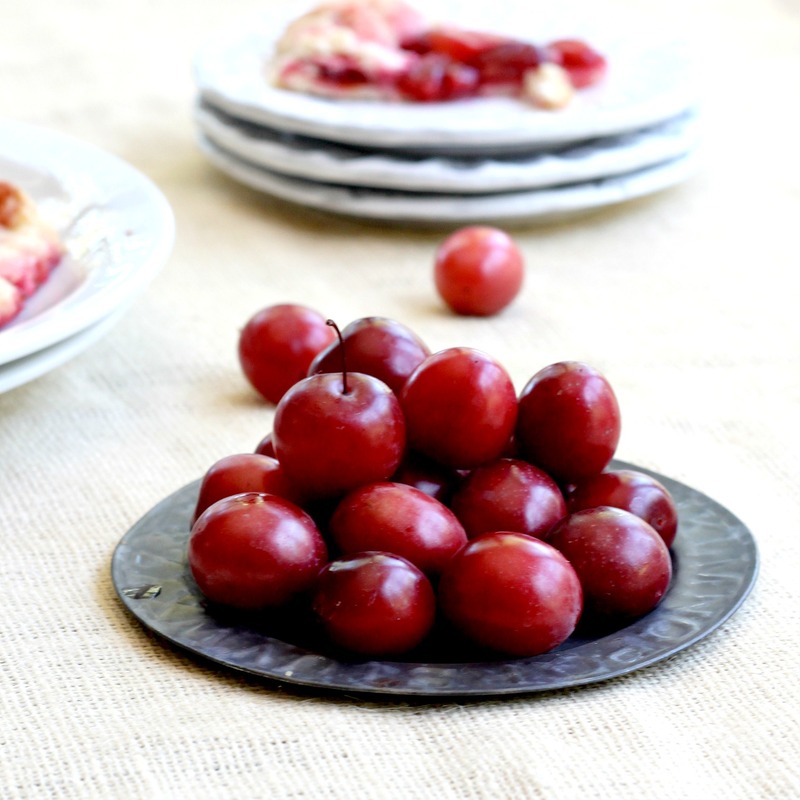 Arrange the plums in a concentric pattern over the almond meal and sprinkle with 1 tablespoon sugar. Fold the dough in over the outer edge of the plums. Brush the crust with the cream. Slide the galette with the parchment onto a baking sheet (or a pizza stone preheated in the oven). Bake until the crust is golden, about 45 minutes. Remove and transfer to a wire rack to cool. Serve warm or at room temperature with whipped cream. Looking for a comforting and more-ish dessert? When it comes to baking, I like my desserts messy, which is to say that I like desserts that are free-form, imprecise, and often referred to as “rustic.” Thank goodness for the generations of country kitchens which devised homey, family-style, and more-ish desserts. Often involving fruit and usually containing folksy and forgiving words such as crumble, slump, crisp and fool, these desserts revel in imprecision, delightfully embracing dribbles, lopsidedness, and even mistakes (tarte tatin, we are looking at you). Sure, some technique is involved, but the overriding rule is a relaxed unfussiness with a big helping of simplicity. Bring on the mess. Which brings me to these slightly disheveled crostatas (actually, I believe that’s crostate in the plural). Citrus is abundant right now, and with that comes the ruby blood orange. Sweet and tart, murky and winey, the blood orange is more nuanced than its navel counterpart, and its brilliant hue is a sight to behold when presented in desserts. I brought a bag of these oranges this past weekend, and made this recipe. It takes inspiration from a recipe I found years ago on The Kitchn, to which I’ve added my own tweaks – including a luscious salted caramel sauce drizzled over the crostate when serving. 1. Make the crust: Combine flour, sugar, and salt in the bowl of a food processor. Briefly pulse to combine. Add the butter and pulse to achieve a crumbly consistency. Add the sour cream and pulse a few times until the dough just begins to stick together. Turn the dough out onto a piece of plastic wrap and shape into a disk. Wrap and refrigerate for at least one hour. 5. Brush the pastry dough with the egg and sprinkle each crostate with about 1 teaspoon demarra sugar. 6. Bake the crostate until the crusts are firm to the touch and golden brown, about 45 minutes. Remove and cool on a rack. Serve warm or at room temperature, drizzled with Salted Caramel Sauce (recipe below). 1. Pour the sugar into a large heavy-bottomed saucepan. Cook over medium-high heat until the sugar melts, whisking occasionally and swirling the pan to ensure even cooking. When the sugar is the color of dark amber, remove the pan from heat. 2. Carefully add the butter (it will foam) and stir until melted into the sugar. Carefully pour in the cream (it will foam again) and whisk until smooth. Add the salt. Cool slightly and then pour into a glass jar and then cool the sauce completely. We have been traveling. Each summer our family returns to Europe, where we spend time living and working from abroad. This year we moved around quite a bit, so while I have been posting regularly to TasteFood, it’s been on the fly, with less time for reflection than I prefer. We exchanged homes with a Danish family and called Copenhagen home for a month, just like the old days when we lived there. We visited Prague, Munich and Salzburg. Our return to the U.S. was via Iceland where we took full advantage of our layover and stayed a few days, exploring lava fields, geysers, waterfalls and hot springs. The journey continued on to New England, where we enjoyed a few days on Martha’s Vineyard with good friends before heading north to our present and final destination, visiting family on the coast of Maine. As our trip nears its end, we are winding down and relaxing in a house perched on the rocky coast. I look forward to returning to my kitchen and desktop computer, and sifting through the many impressions of our travels. At this moment, it’s mid-afternoon. Dinner is a several hours away, and I have time to myself. There is a wide view of sparkling sea with windjammers and schooners navigating the craggy islands from the living room window. Some family members are climbing on the rocks, exploring the tidal pools below me. Others have departed for the nearby town, where, this weekend, the population has quadrupled in honor of its annual Lobster Festival. And I am at the computer, enjoying the luxury of the view and the presence of family – with the peace of an empty house. I am thinking of my next blog post and what to cook. It’s making me hungry. Earlier today, I was at the farm stand purchasing with my eyes and my appetite. I bought inky blue Maine blueberries, headily perfumed strawberries, and a brown bag filled with ripe purple plums. Tonight we are eating lobster for dinner, which we will pick up from the local fisherman at the wharf. And I am going to make a dessert. Blueberries are obvious to use, but they are not my daughter’s favorite, and this weekend we are celebrating her birthday. The strawberries are too luscious to do anything with, except eat straight as they are. 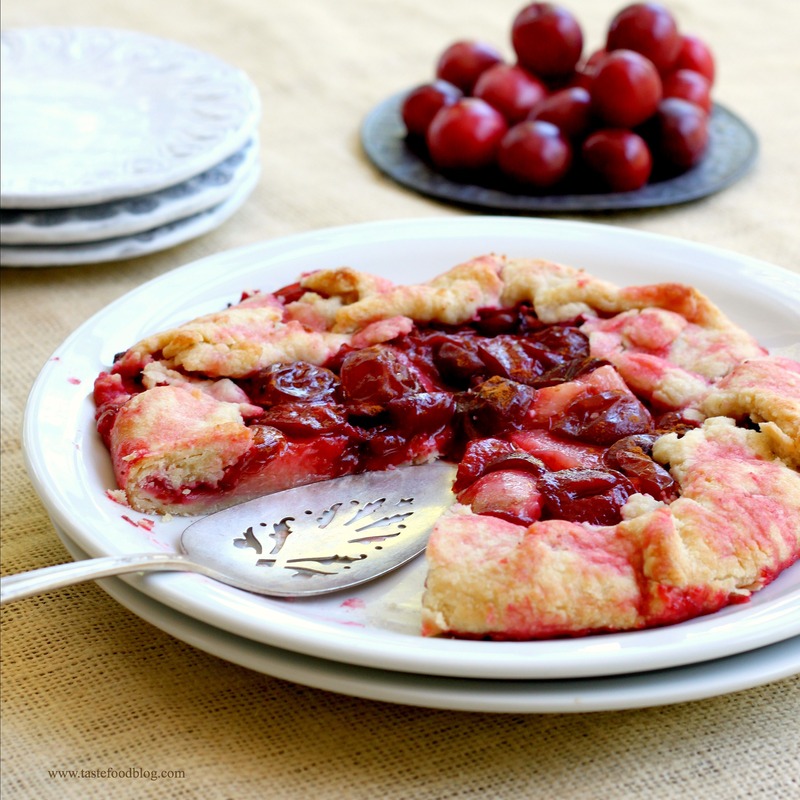 So, I will use the plums and make a crostata: a homey dessert to conclude the meal and the end of our journey. Combine flour, sugar and salt in a large bowl. Add butter and work into flour with fingertips until the dough resembles coarse meal. Add enough water to bind the dough. Form dough into a ball and flatten into a disk; wrap with plastic wrap. Refrigerate at least one hour. Preheat oven to 400 F. Toss plums in a bowl with 4 tablespoons sugar, lemon juice, vanilla and cinnamon; set aside. Roll out dough into a 12 inch circle. Sprinkle 1 tablepoon sugar and 1 tablespoon flour in center of dough, leaving a 2 inch border. Mound plums over sugar and flour, reserving any juices that have collected in the bowl. 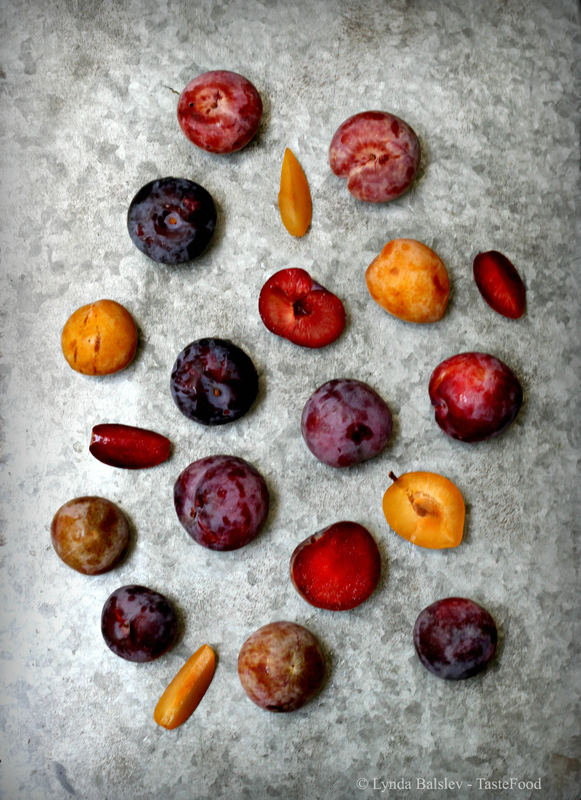 Sprinkle plums with 1 tablespoon sugar. Fold border of dough up and around the plums. Bake in oven until crust is golden brown, about 30 minutes; remove. Pour reserved juices from the plums into a small saucepan. Bring to a boil and simmer until reduced to syrup consistency, 3-4 minutes. Brush plums with syrup. Serve crostata warm or at room temperature with whipped cream or vanilla ice cream. I’m sorry. I live in California. At about this time of year I find myself prefacing my cooking with this admission, when the month of February rolls around and my recipes take on the air of spring. While we lived in Europe, especially in London and Denmark, February was just another winter month – drizzly, dreary and dark. Sunshine, daffodils and mimosas were whispered rumors from our southern European neighbors. If we wanted to experience them it required boarding an airplane. Otherwise, we continued lighting our fireplaces, making stews and wrapping ourselves in wool while patiently waiting as the days crept longer. So, instead of flaunting a springtime recipe with impossible-to-find ingredients for those of you knee-deep in snow, this recipe for Blueberry Crostata is one we can all make. Blueberries can easily be found in the freezer of our markets, or, if we’re lucky, there may be some remaining in our own freezers from last summer. And since we can all do with a little sunshine, the crust and filling are brightened with fresh lemon zest. Enjoy. Combine flour, sugar and salt in bowl of food processor. Pulse to blend. Add butter. Pulse until mixture resembles coarse meal. Whisk egg yolk with 2 tablespoons cream in a small bowl. Add to dough and pulse to blend. Add remaining cream and pulse until dough sticks together. Gather dough in a ball, wrap in plastic and refrigerate 30 minutes. Preheat oven to 350 F. Roll out dough on a lightly floured surface in a 12″ round. Toss blueberries, 2 tablespoons sugar and lemon zest together in a bowl. Mound blueberries in center of pastry, leaving a 2″ border clear. Brush the border with egg white. Gently fold in pastry over blueberries, leaving center exposed. Brush pastry with egg white. Sprinkle remaining 1 tablespoon sugar over blueberries and pastry. Bake in oven until pastry is crisp and golden, 45-50 minutes. Serve warm or at room temperature.